You are what you eat. If you eat healthy you stay fit. But what happens if the vegetables and fruits you buy from the market are packed with deadly chemicals – many of them banned. A study by the Food Safety & Standards authority of India under the Agricultural Ministry discovered that the veggies in the market were concentrated with chemicals a thousand times more than the permissible limit. If you chop veggies at home you will realise that you no longer need to check the Ladies Finger for the small black worm – because they don’t exist. Pesticides have helped the farmer prevent wastage and improve his productivity. Yields are better, crop grows faster, and there is better hope for making some money after all the middlemen have had their share. But they come with a cost – a steep cost to your health and the farmers health. The solution to this is Organic Farms – a phenomena that has started recently. The educated Indian is concerned and A Few Good People are investing their time and money to educate farmers and grow food that is healthy and nutritious. 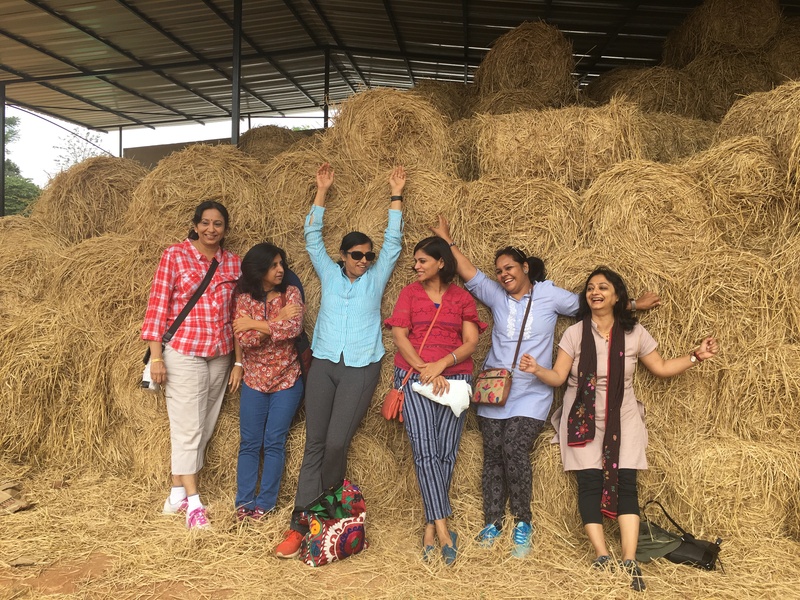 Farming is hard work – which is what we discovered when we made a day trip to Mapletree farms at Thalli, a scenic village in Hosur, Tamil Nadu located about 50 Km from Bangalore. Mapletree farm is a joint effort by Ex Infosys Founder Shibulal, Ex OnMobile Founder and CEO Mouli Raman and Ex Founder of Hillview Organics, California and Organic Farming Teacher Shankar Venkataraman. We visited the farm and were impressed with the passion and dedication of Shankar who runs the show. A BITS Pilani Graduate who was working in Texas Instruments and later relocated to US, Shankar has found his purpose in life. He lives in the farm and visits his family in US once in 3 months. Over the last 3 years he has helped build the farm engine with a deep sense of love and compassion for the team. Having set the foundation the business is now scaling rapidly. Shankar explained to us the challenges of farming in India. Rapid exodus of next generation from farming is a concern and unless a farmer makes a steady income of Rs 25,000 a month the future is doomed. Farming needs to be seen as a sustainable, profitable business that is respected by the community. A Farmer needs to learn to respect Mother Earth and ensure that she sustains us for the future. Educating the local farmer of the negatives of short term benefits from the usage of chemicals is an important part of his mission. Mapletree is not just an Organic farm but also a place where the youth and the Local farmers can learn the best practises for producing healthy food. He explains that excessive use of pesticides and chemicals has made almost 25% of farm land in China non cultivatable. We see the same trend in Punjab and Haryana where excessive usage of Urea has made the fields devoid of nutrition. At Mapletree the only fertiliser used is Cow-dung. There is a reasonable gap between two cycles of crops and leguminous plants that make the soil rich in nitrogen are planted during the gaps. This helps the soil to gain its nutrition. Yes the lack of pesticides does result in crops getting wasted and there is a 30% loss of produce. Level of handholding is higher – all of this adds to higher costs. The Veggies from an Organic farm are more expensive than what you get in the shop next-door. But this is the price you have to pay for healthy food. Mapletree is one of the few Organic Farms where most of the produce comes straight from the farm (Almost 60%), while other Organic Brands are just traders procuring material from farmers. Shankar is working towards increasing this ratio in the coming years. The farm also has a 100 + cows, many are non milch cows but are still useful for the manure. They sell milk, butter & paneer. This 45 Acre farm is rustic, calm and serene – its not a manicured pedicured farm that you may see in pictures, but its a happy place with a lot of positive energy. Mapletree Farm serves over 200 Apartments and Villa communities in Bangalore. Over 4000 households get their weekly supply of vegetables and fruits straight from the farm to their houses. Demand is soaring – there is no marketing but the good news is spreading word of mouth as more and more customers join the healthy food bandwagon. From a humble beginning this 45 Acre farm now notches revenue of 45 Lacs a month. Employing over 100 people who work hard almost 12 hrs a day. A great beginning to help you eat a healthy meal. If you want to join the ” eat Healthy – Stay Fit” movement reach out to Mapletree. The information below will help you to get started. Call customer support to register and buy (whatsApp preferred): 97909 48235 — Vikram is our head of customer support and he will help you. We deliver 6 days a week in different parts of Bangalore: We deliver 2 days per week to specific locations and you can receive 2 deliveries at your doorstep per week from us if you request us. Very Useful and Interesting VAK. Thanks.